Sorry if u already mentioned but what’s the scoop on acrylic plates. Messaged Jordijolimon this morning, haven't heard from him yet. He's probably really busy. Waiting on one more prototype plate from him and then I am going to order a bunch in all colors if it works. Problem is, the past have broken super easily. And the ones that haven't broken, I've had to dremmel extensively to get them to work. I for sure will liquidate the Pearl Factory inventory once everything is sent out! HHmmm... what are the chances of having extra purple or cyan pearls? The mix and match top bottom looks very cool...any chance we can buy extra top or bottom if any? wow many people want extras. Hey! If I find some boards are straight fckd when QC'ng them, there wont be extras. If all boards are fine, in the end there might be 1 extra in the most popular colors. I never really thought about buying extras since this GB wasn't a "for profit" kind of thing. I'm sorry everyone, figured everyone who wanted one got in on the GB. I went through all the Gray Pearls last night. 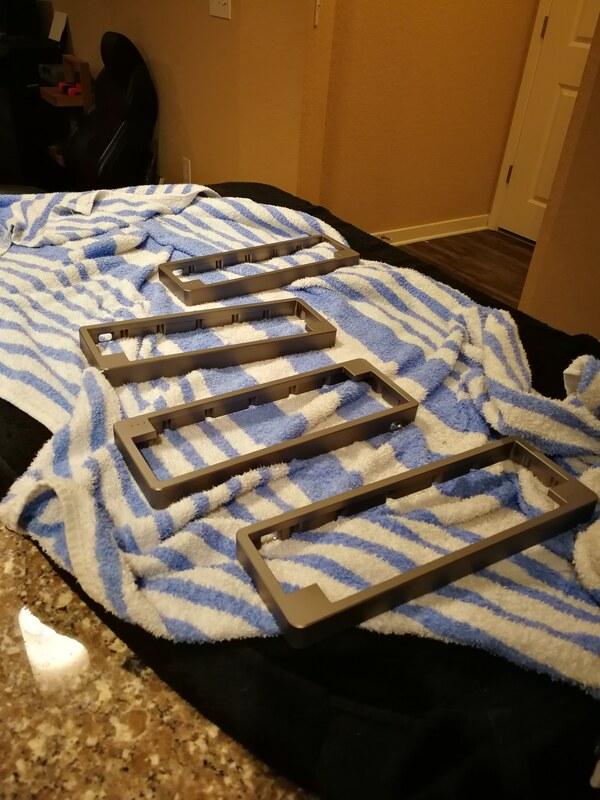 I listed two bottom case parts as b-stock since the anodizing is kind of weird, and one top case part as b-stock as well since it has a tiny little impact chip. Didn't think these issues were big enough to reject them. The bottom parts are fine on all areas that will be seen when using the Pearl (side perimeter). 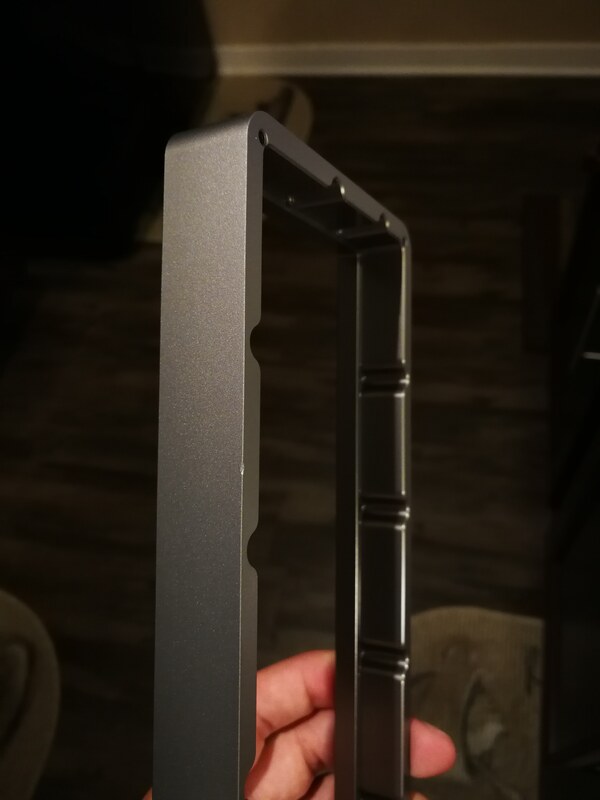 Only the bottom and top of the BOTTOM case parts have the weird anodizing. But the bottom sits against the desk and the top is covered by the other case. 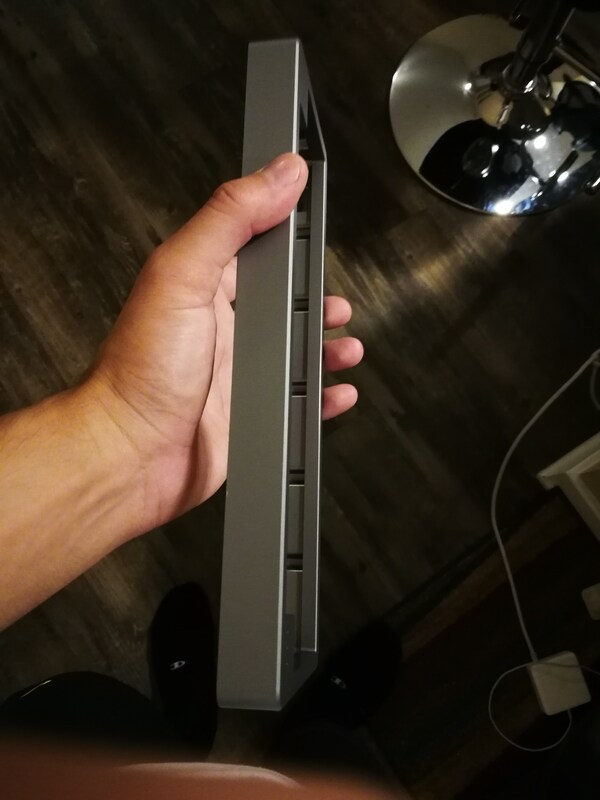 If anyone here has a gray order and is willing to take these b-stock parts, which are still beautiful, I can try and work out some discount or something, and I would be very appreciative. As a matter of fact, if I find more b-stocks that I don't reject, ill list and if anyone is willing to take them I will do the same! Please pm me, possibly list an order #, I can try to ship your Pearl early too for your kindness! Small impact chip - Listing as b-stock. Anyone willing to take? Dana if you read this, your order is packed, ready to ship tomorrow! Then, if you have only 1 extra later, who can buy it? is there an opportunity for the first person you asked? Or are you will getting a new application? On a side note, Koob. I have the same color kitchen cabinets and the same handles as you do. 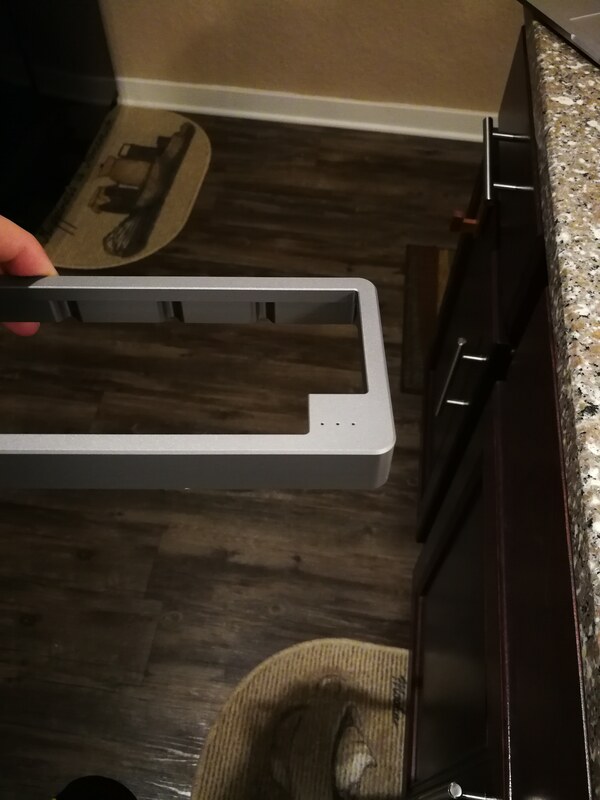 Are you doing QC at my house and I didn't realize it? I might be, or I might not be. Depends, who's askin?! 1. If you want acrylic plates shipped with your Pearl order, please pm me or post here with your order number. My acrylic provider, Jordijolimon, has mentioned to me that the available colors are clear, frosted, black, red, cyan, orange, neon pink, dark transparent green and blue. I plan on buying like 30 of them from him, split between those colors, and then charging you $35 for them. I will stock them in my site as well if they don't sell before i ship your order. You can always buy them after, but best i send with your order. Free shipping CONUS as well. 2. If you have an address change, please message me that as well. Check your order receipt and make sure it matches your current address if you are unsure. 3. If you have pm'd me before about anything important about your order, not regarding an extra Pearl, please feel free to remind me of it again. Because my brain is in a million places and i could have forgotten or not written it down. Hi Koob, order #1056 here. I'll take an acrylic plate. Would you post pics of the different colors once you have them in your hand? I have PM you before, can you verify the color of my Pearl as well? Do you have extra PCB, just curious. Thanks much. Have a great rest of your weekend. Pretty darn cool looking case, man. Hey guys! Thanks for all the pms! Been packing orders today and a few of you have been asking about the boards assembly. One of my good discord friends runs a build/repair/assembly service. He's an older guy and has a lot of experience and tools. Stuff like a Hakko FX-888D, Ketser 44 solder, desoldering vacuum, multimeter, etc. Anyways, he's doing a 10% off for me. Thats $18 for a Pearl built. You would pay shipping and the cost of any switches or top leds! So if you are worried about building your Pearl check out his website - https://www.turbokeys.us - and check out his reddit post - I talk to him on discord over pms so if anyone needs help communicating with him just lmk! Perfect! Yes i'll post some pictures for you! Your order is Silv/Brss with an extra PCB. Got all that here, no worries. Look ok to you? Have a great weekend too! Thank you! If someone ever wants to sell a spot i can let you know as well! Oh, I just send you a PM. Hopefully there is not a mixup here. Great, just making sure. 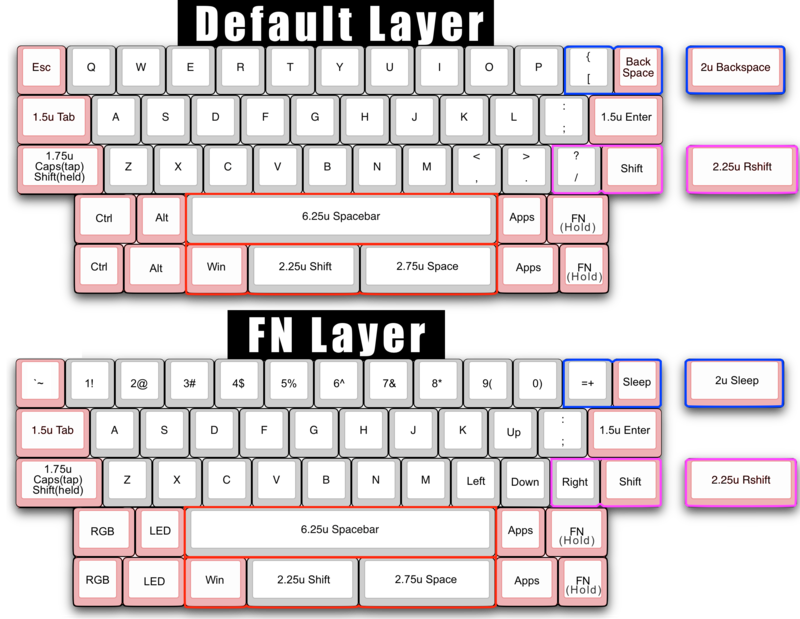 Any extra PCB available if I get an acrylic plate? Also, I'll wait for you to receive the plates, shipping overseas is too expensive for just a plate and a pcb. Hey guys!! Wow, i see emails have been going out haha. Very happy to see. Ive packed (not shipped) the first 25 orders so far (120+ to go), and am trying to get through printing those labels. Tomorrow my friend will drop some of them off, and the next day more will be dropped off, etc. Every day after work i try to pack a few more, and eventually when I've collected enough, i will again reprint labels and send them out in the following days. So they will be shipped in batches guys, and its a slow process, and its mostly first order first serve style. I might arrange for pickup as well at some point, and that would land shipping on every other Saturday. So weekly shipments. Important notes, make sure to double check your address, and if its an international order out of the USA, i need a phone number from you. Ive already isolated 4 boxes that are going to japan, china and Canada where i wasn't provided a phone number. Ive emailed those people already and am awaiting their replies. That looks like a well padded shipping box. You could probably put more than one Pearl in that flat rate priority mail box. Congrats Koob, almost done with your first GB and early to boot Must be satisfying seeing your Pearls heading out into the world after all the hard work. Gotta love those box stack pics. Lmao Puddsy. Its so cramped in here :/ But its a good box, and i have been overkilling the packing. Nothing is left unpadded, everything is super bubble wrapped, the bottoms are lined with either some foam or more bubble wrap, i really hope they are safe. And yea, some boxes have a lot of stuff. Glad to see these going out Koob. Great job!! Haha thanks a lot!<3 All the colors are amazing, not one is better than the other in my opinion Brass is super strong. PERSONALLY i like lubed liners on acrylic. That being said, my friend R0b0tical just built his Pearl with a brass plate and lubed vintage blacks with vintage mx clear springs (ghosted the blacks). And well, it typed super nice!! You are right. I cant change the virtual order, but i can change the physical one I have you down for a CYAN. Not sure if I've already asked about this: there are cables included but are the cables all matched with the case color (i.e. cyan cable for cyan Pearl)? Or we're colored cables some extra things and the default is some black cable? I think I remember seeing cyan cables somewhere. Thanks for all the hard work Koob. Can't wait! I am. Things got a bit complicated with that. Komatoz, my artisan maker, was having issues casting the artisan chests because of time issues/equipment/weather. She teamed up with BoomSnap! Caps and he is finishing the casting/shooting. I have been keeping track of them as best as I can without micro managing anything, but BoomSnap! Caps is working on this as we speak and Komatoz is working on sending me auth cards/goodie bags. The giveaway receivers have already been randomly selected from all my order numbers and they will most likely receive the cap separately from their order, so don't expect anything yet! Also, shipped around 25 orders today. 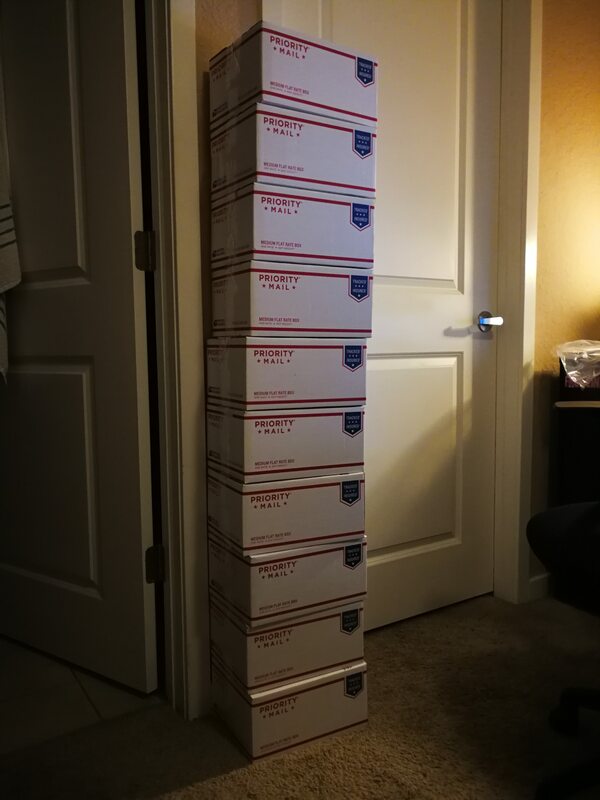 One was dropped off at USPS, the rest were dropped at a packmail service to be picked up later. The orders numbers were 1006 to->1037, with some of those not shipped and waiting a phone number from the customers. Other random orders were shipped also. I updated tracking via email and your PayPal order if applicable. Expect them to arrive Thursday 2/22 or Friday 2/23, no signature required. Jordi also sent me 2 acrylic plates today from Cali. I am hoping these work and are the final design so I can pull the trigger on making the rest. Stay tuned! Saw that, yup! You're the best! I'll send you some build pics and such this weekend probably. Let me know if i can be of any help. Definitely excited to show this one off! Nice. I’m #1035, so hopefully I’m in that batch. I forget what my order number is, but it will be a nice surprise whenever I get my pearl in. I ordered a cyan Pearl40% so I will be just fine rocking a cyan cable. Thanks! Our boy jetpacktuxedo putting in work Still need to make that QMK guide x! page and just go ahead and remind everyone of a few tips. I hope that everyone enjoys their Pearls and they arrive safe. They aren't perfect, but i hope they are perfect enough for you! 2. Same with the plate! This prevents stripping. 3. If your brass plate is slightly bowed or bent, just apply a tiny bit of leverage and bend it back. 4. On the switchplate, the OPEN 2u top corner is where the backspace goes, if you can orient your plate correctly.